A limited number of scores will be available for borrowing on the day. The choir will be directed by Peter Barley, organist & choir director at St. Mary’s Cathedral, and will be accompanied by Bernadette Kiely, organist & choir director at St. John’s Cathedral. Peter Barley and Bernadette Kiely are both founding members of Limerick Pipe Organ Festival. On Friday 18th September 2015 from 8.30 – 9 pm Peter Barley will give a recital for Culture Night 2015 in St. John’s Cathedral. Peter Barley is Organist & Choir Director in St Mary’s Cathedral Limerick and a founding member of Limerick Pipe Organ Festival. 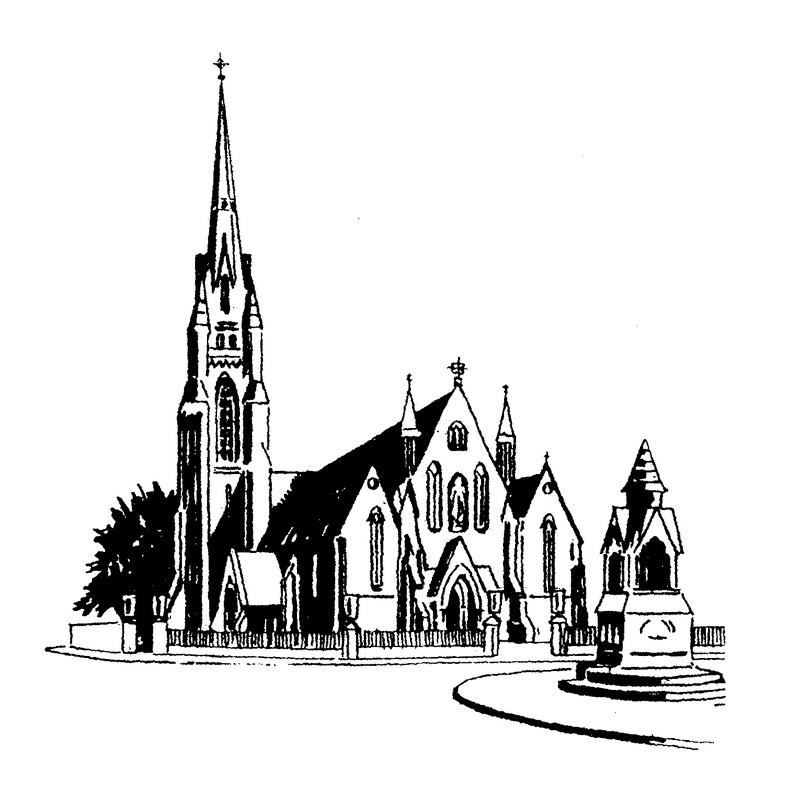 Also, at 7:30 – 8:00pm in St Mary’s Church Athlunkard St Limerick Carolann Guinee and Riona Curtin will play the organ there. Carolann Guinee is Organist & Choir Director in St Joseph’s Church Limerick and Riona Curtin is Organist in Church of the Assumption Abbeyfeale Co Limerick. 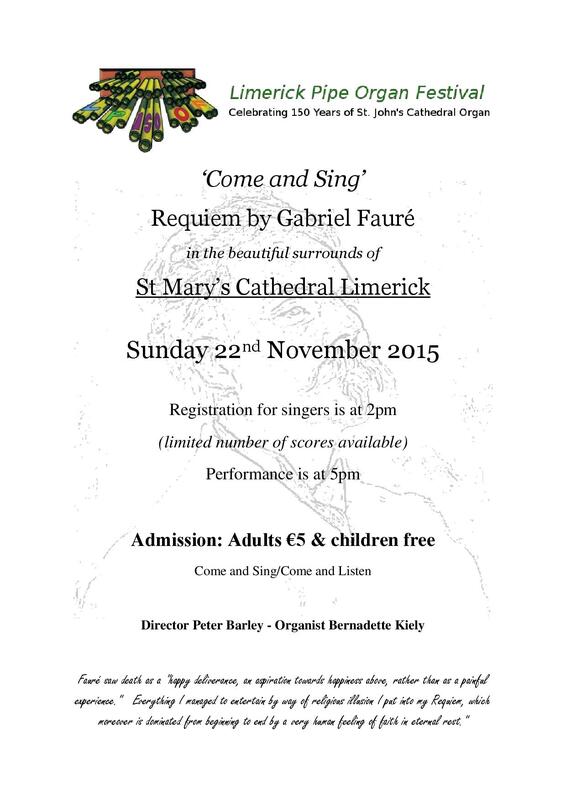 Both are members of Limerick Pipe Organ Festival Committee. 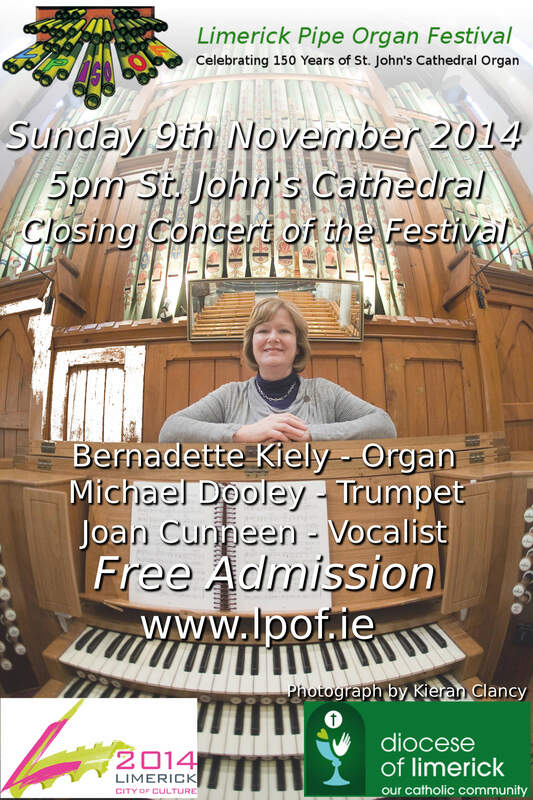 The closing concert of the festival features three local artistes, Bernadette Kiely, Michael Dooley and Joan Cunneen in a programme featuring solo organ, trumpet with organ and voice accompanied by organ. Admission to the concert is free, if you are in a position to donate to the retiring collection, please note that the proceeds will go towards the organ maintenance fund. Thank you. Click Read More to see the concert programme. Pipe Organ Festival has been the emphasis on improvisation. The 150th anniversary concert in May, given by David Briggs, and the July and August concerts given by Cyprian Love and Columba Mc Cann in Glenstal all featured extensive improvisation. For an insight into what improvisation actually is click here to read a fascinating article by Cyprian Love.